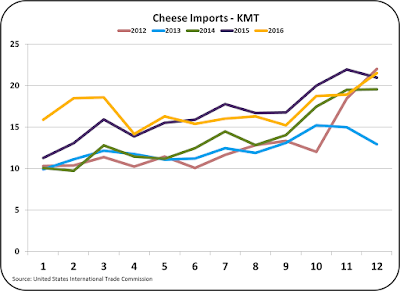 In the prior post, 2016 exports and imports of cheese and dry whey were examined. 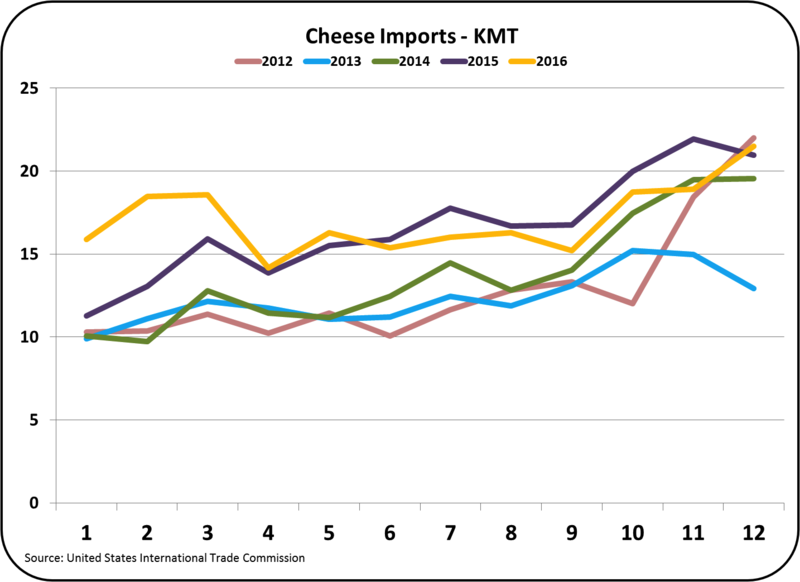 This post will examine the 2016 exports and imports of the other two dairy commodities that are used to calculate producer dairy prices. Those commodities are butter and nonfat dry milk (NDM). 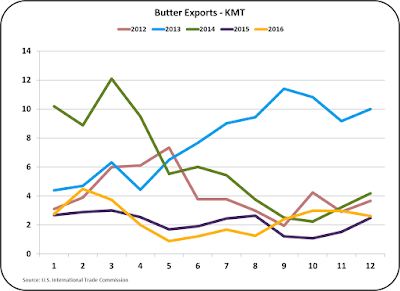 Butter exports remained extremely low as U.S. prices for butter were well above international prices for most of 2016. 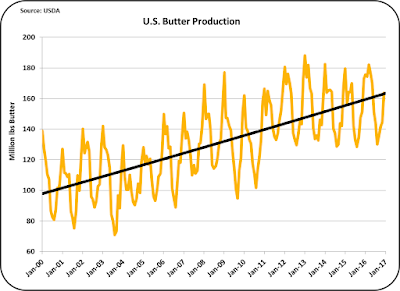 Increased consumer demand for butter in the U.S. combined with lower U.S. production has kept U.S. stocks low and prices high. 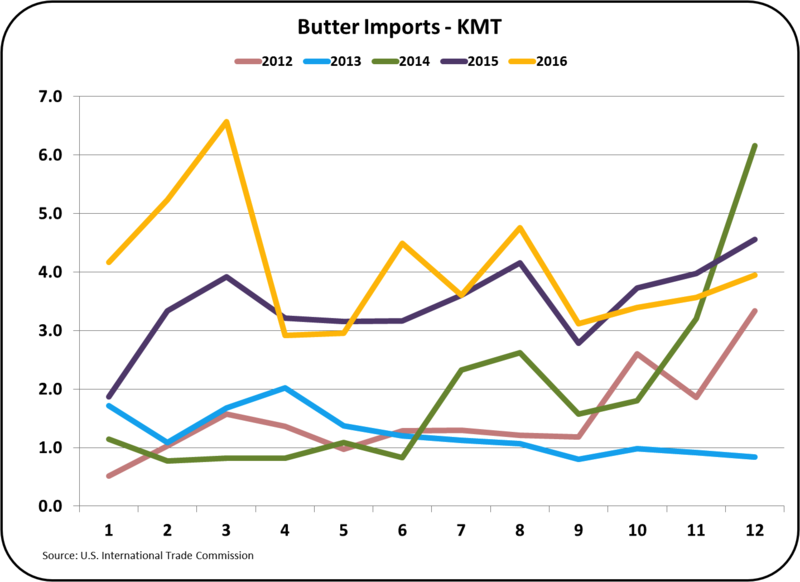 The little butter that is exported is primarily going to Canada and Mexico (see chart below). 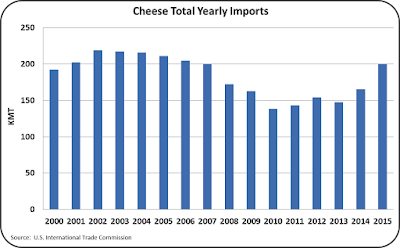 Canada has a very protective dairy industry, which does not allow any imports except for a few specialty products. 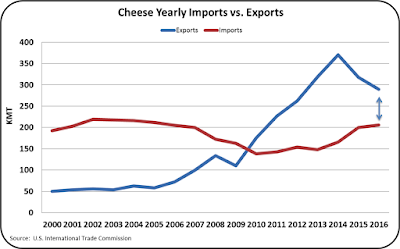 The Canadian dairy import market is protected by exclusion from NAFTA and trade agreements with other countries. 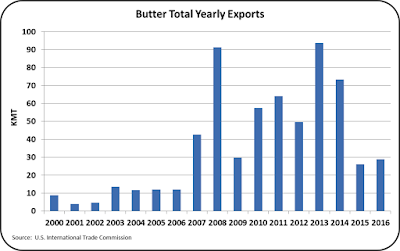 So why is Canada our largest butter export market? The Canadian dairy industry is isolated with almost no exports and tight restrictions on imports. The payment system is very favorable for Canadian dairy producers, but this results in higher wholesale prices of dairy products. 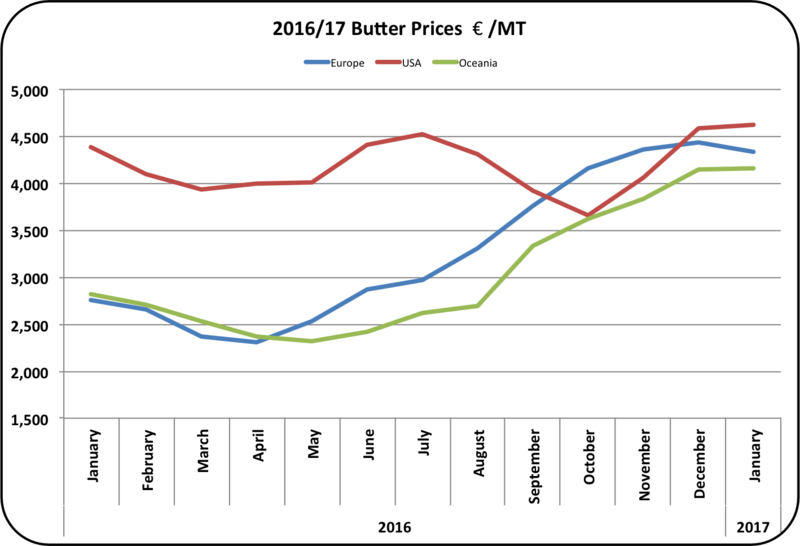 The higher Canadian prices make it difficult for the Canadian dairy market to compete internationally. 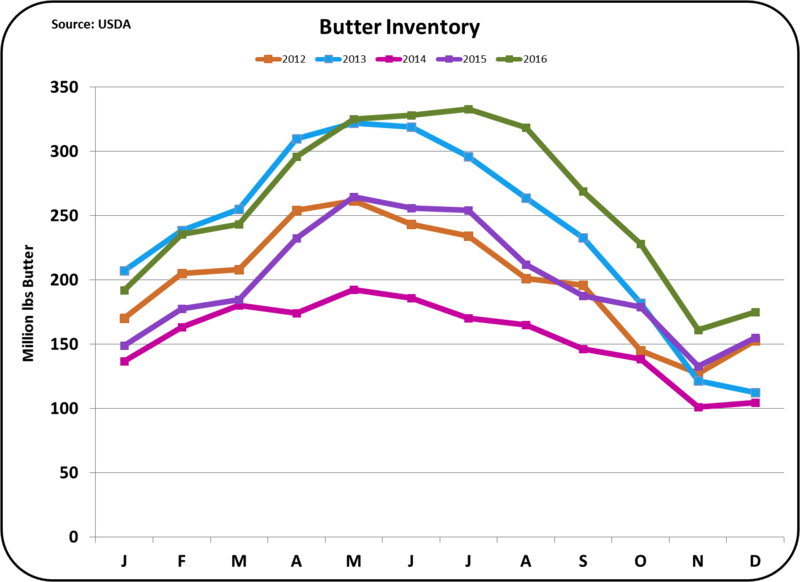 Per capita consumption of butter in Canada and population growth have put pressure on butter availability. 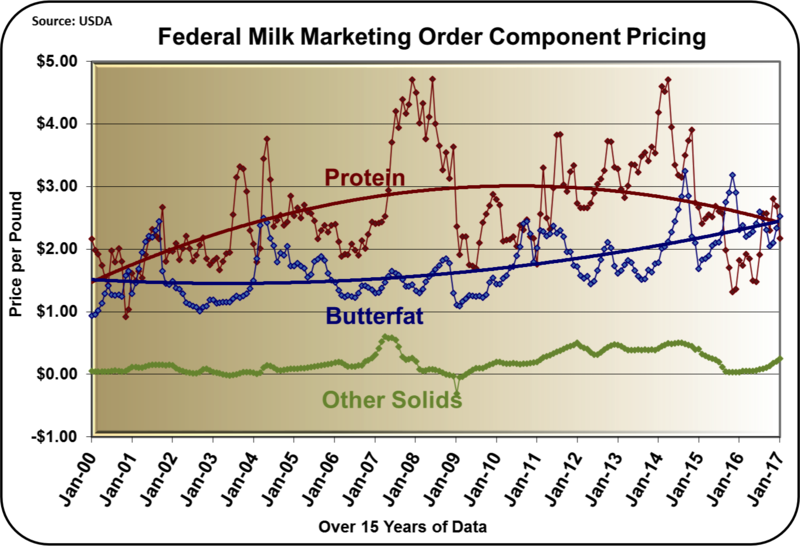 When butterfat is removed from milk the resulting skimmed milk or skimmed milk powder has a very limited market outside of Canada. Because Canada has good transportation and available refrigeration, there is very little consumer demand for skimmed milk powder in Canada. The only solution for excess skimmed milk is to dispose of it. Because dumping skimmed milk is not economically attractive, this is rarely done. Therefore, limited amounts of butter are allowed to be imported into Canada. The U.S. is the closest source. As Canada enters into world markets with more trade agreements, some of the barriers to dairy imports will be weakened. The possible renegotiation of NAFTA could also have an impact. 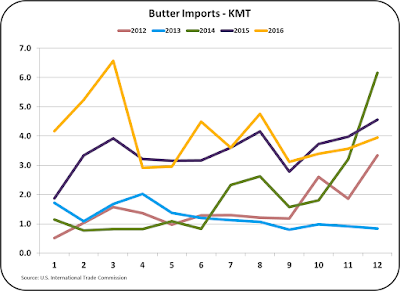 Because U.S. butter is higher priced, the U.S. butter market may have to compete with lower international prices in future sales to Canada. Mexico is the second largest buyer of U.S. butter. 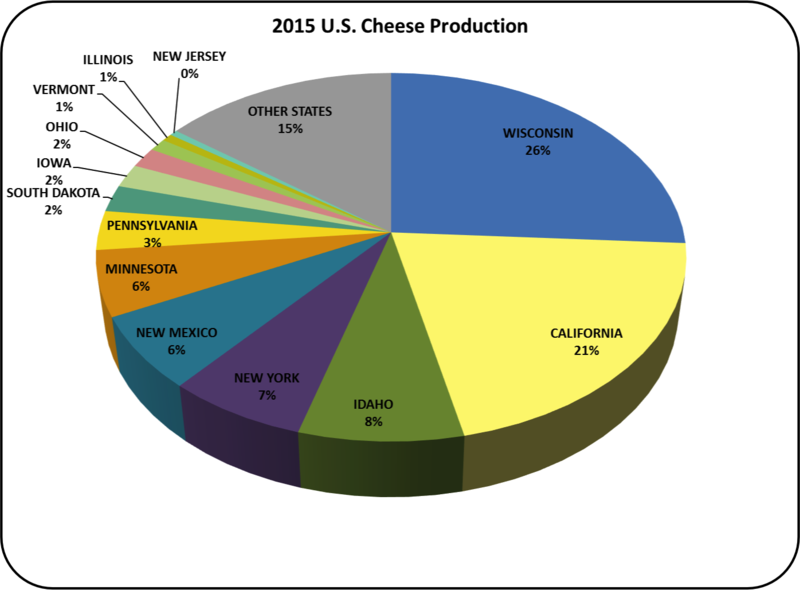 As will be shown below, they are also the second largest seller of butter to the U.S. 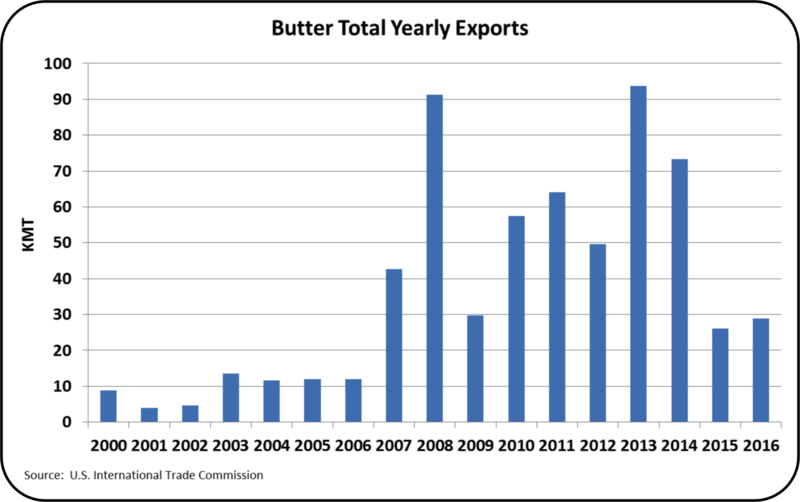 The low level of butter exports has continued for the last two years. 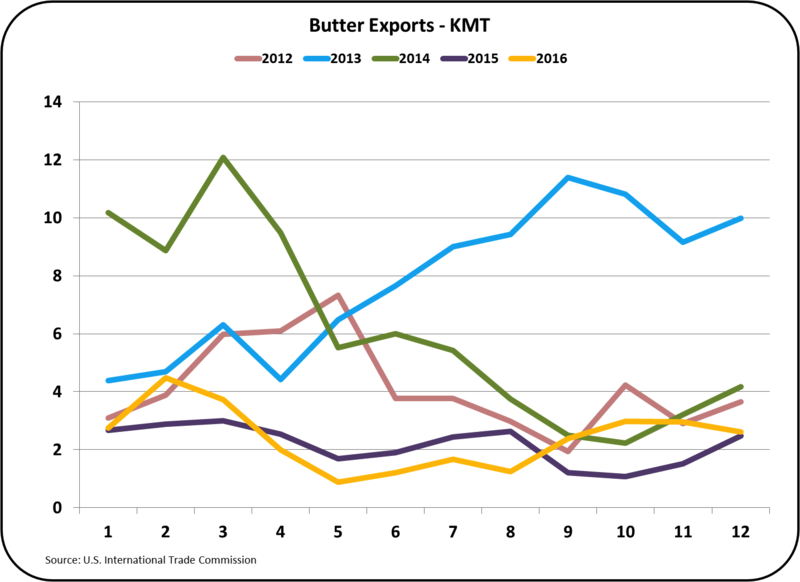 For the prior years 2007 to 2014, exports were much more robust as U.S. butter was priced at international market prices. 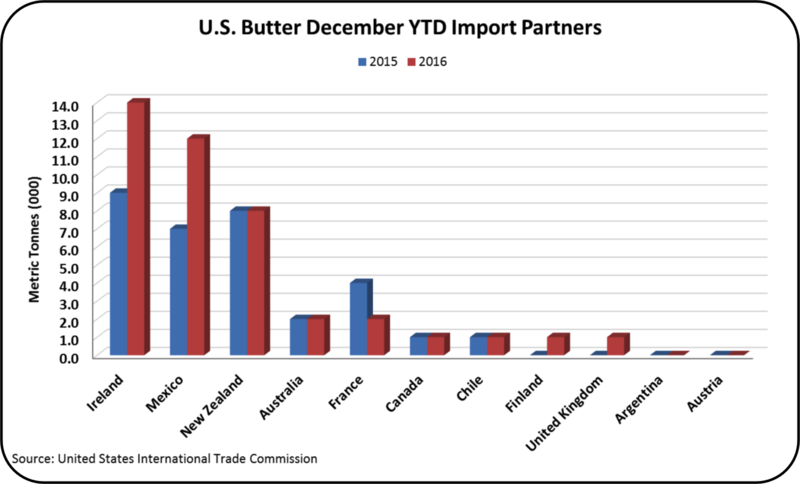 Imports of butter have remained in a tight range for the last 10 months of 2016, continuing at the 2015 levels. 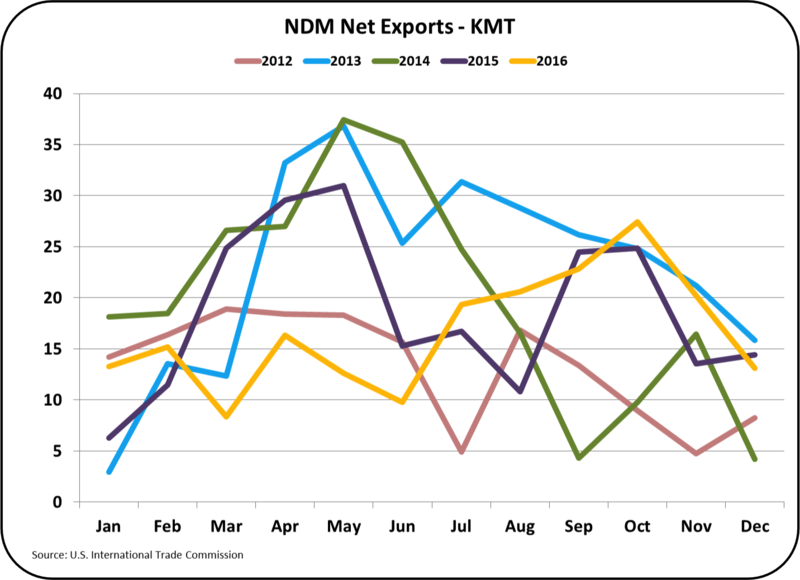 The only real difference between 2015 and 2016 is that 2015 started off with low exports following huge imports in December 2014. 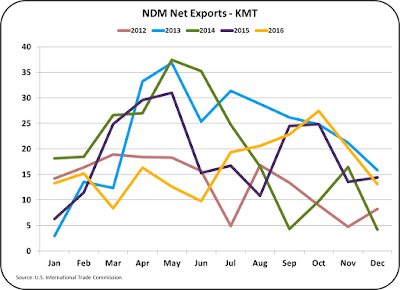 From March to December, 2015 and 2016 were exports were closely matched. Butter imports are coming mostly from three countries, Ireland, Mexico, and New Zealand. Why is so much butter going back and forth across the U.S./Mexico border? Butter in Mexico is less expensive than in the U.S. Butter is a relatively high cost product in Mexico diets, so vegetable oils are often used in place of butter, keeping butter consumption lower. Butter can also be imported into Mexico from other countries at low international prices. 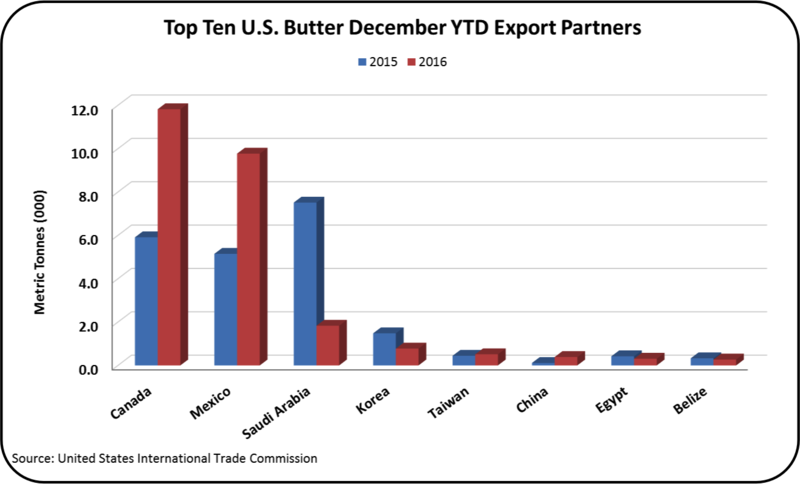 Therefore, the best Mexican strategy is often to export Mexican butter to the U.S. which is allowed via the NAFTA program. 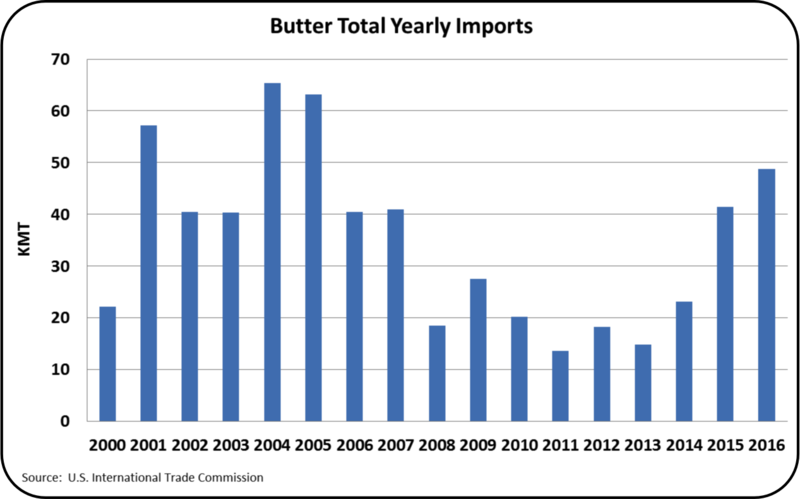 There is now a four year trend of increased butter imports to the U.S. 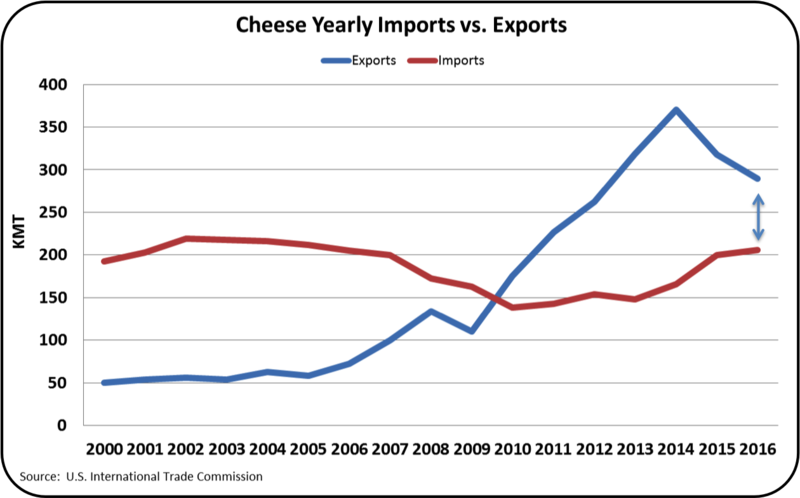 While they have not reached the record levels of 2004 and 2005, if these trends continue, new record imports could occur. 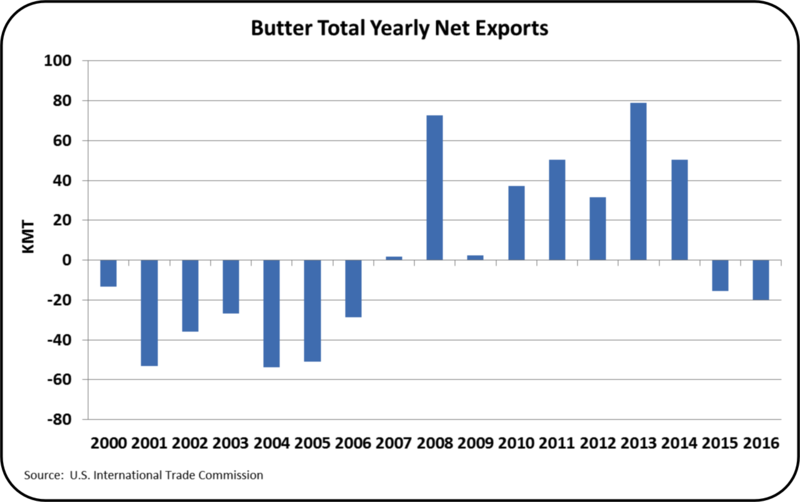 As a result, net exports of butter remain negative, meaning that the U.S. is a net butter importer. 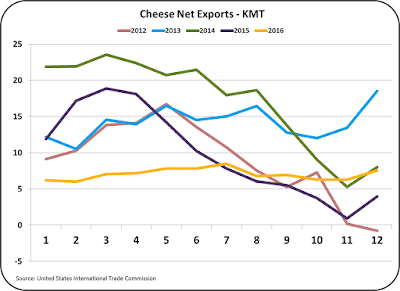 The net imports expanded in 2016, not so much a result of exports which increased slightly, but because imports increased more than exports. 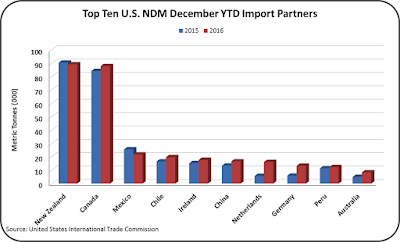 NDM is the largest U.S. dairy export item by volume. 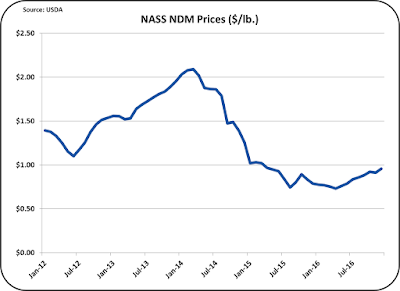 NDM is the basis of Class IV and Class II milk prices and can also be used for setting Class I prices. 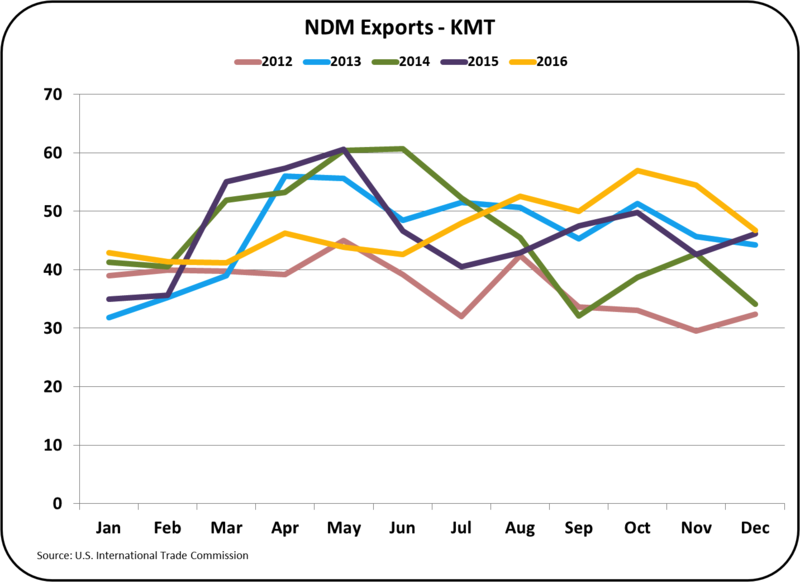 For the last four months of 2016, export volumes were at record levels. 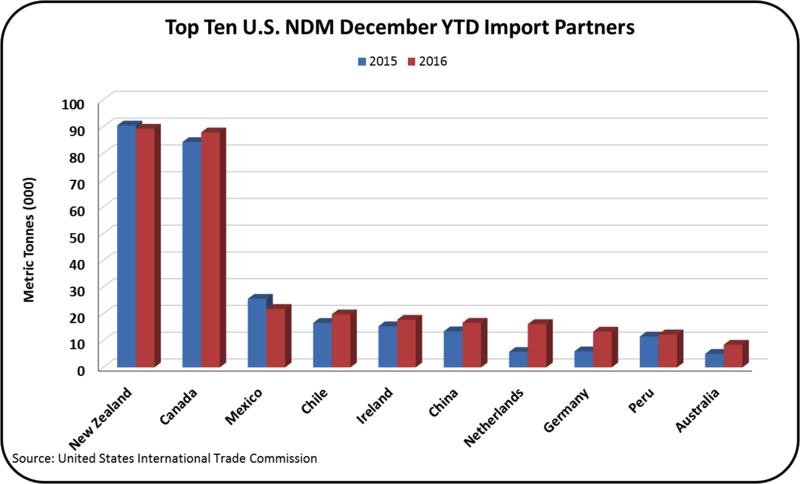 This allowed the U.S. to squeak out a record setting volume of NDM exports in 2016. However, prices were half of the prices received in 2014. 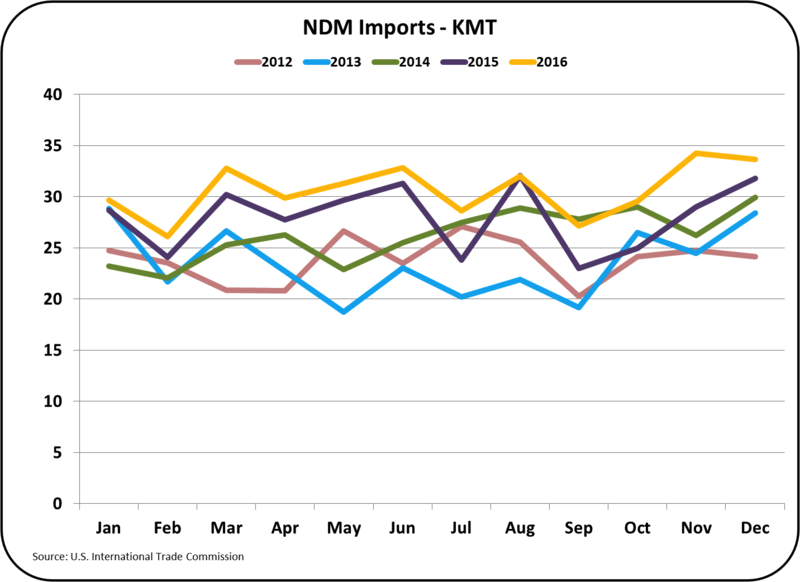 The U.S. has remained aggressive in NDM pricing competing successfully against the EU and New Zealand. 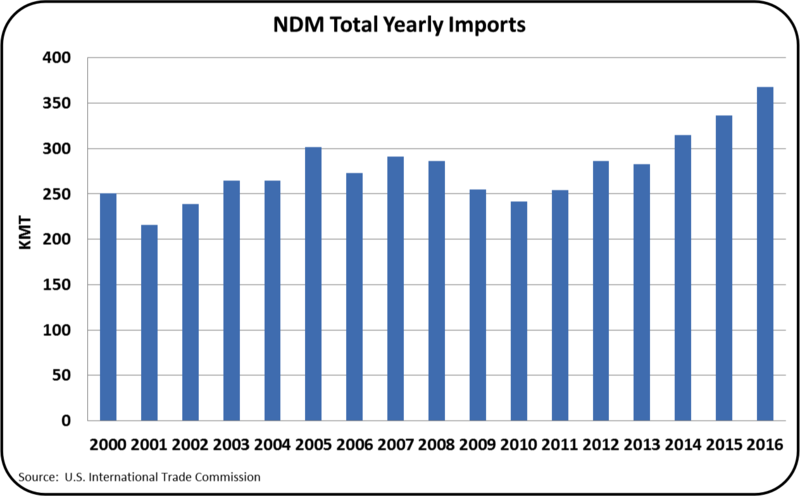 Imports of NDM have been at or near record levels for every month in 2016. 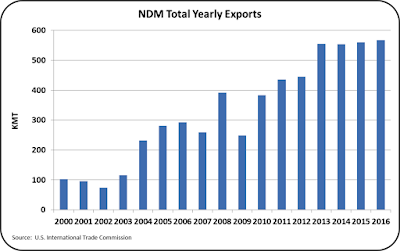 The main suppliers of NDM to the U.S. are New Zealand and Canada. 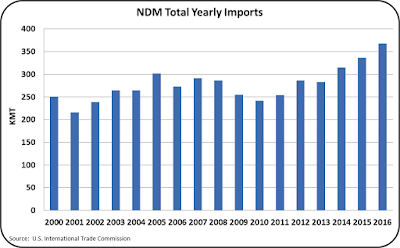 The reason for the high level of NDM imports from Canada was covered above. New Zealand imports were based on favorable pricing. 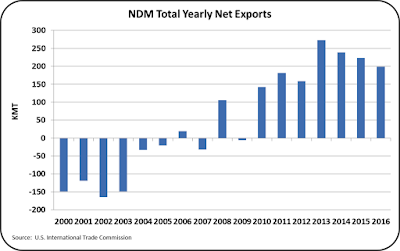 Overall, net exports of NDM were below prior years. 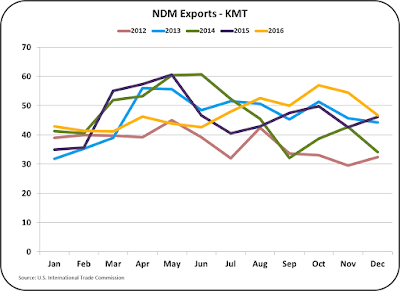 The increased levels of exports at the end of 2016 were outmatched by the increased levels of imports. 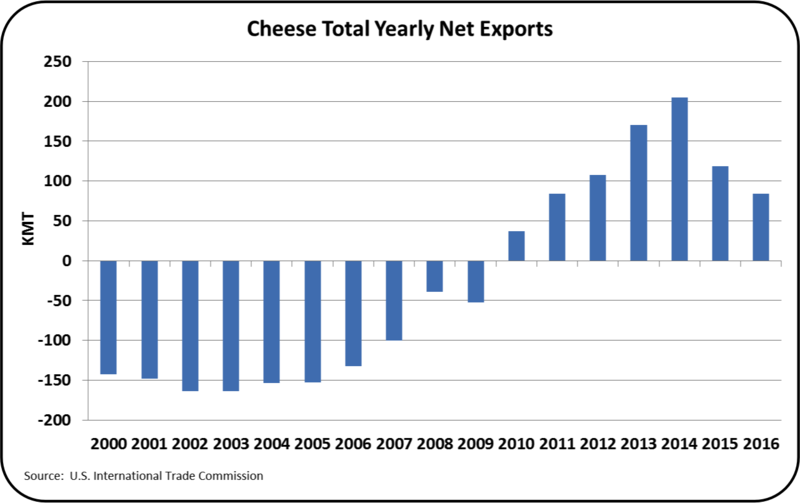 While record levels of exports were "squeaked out," record levels of imports hit strong record levels. 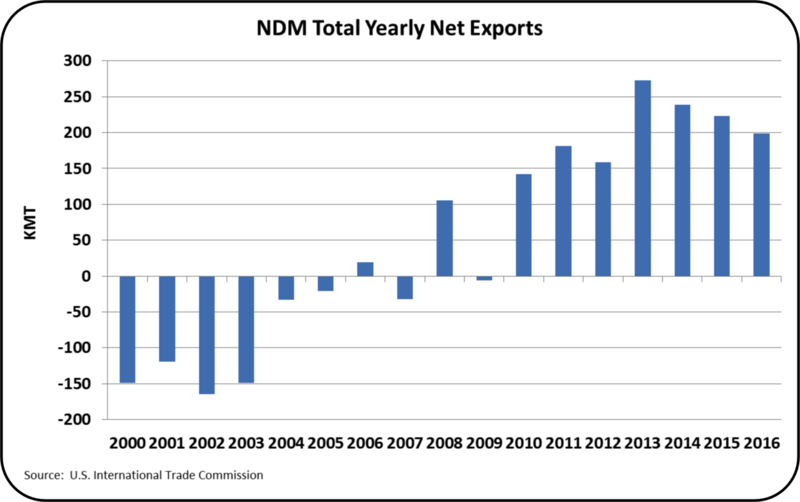 This did result in the fourth straight year of declines in the net exports of NDM. 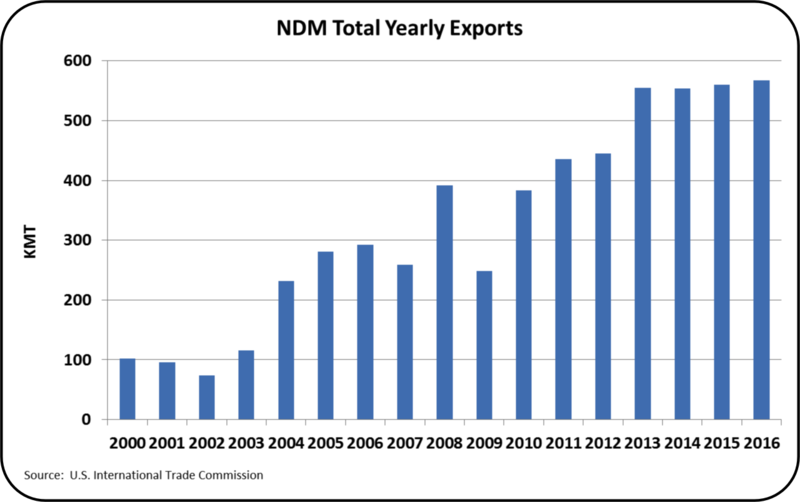 Since 2013, net exports of NDM have declined in volume by more than 25%. 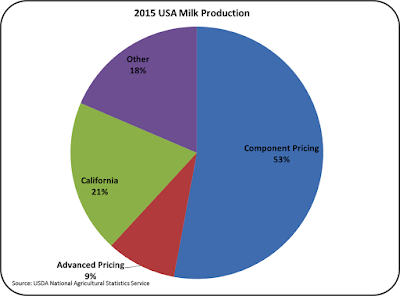 This post and the prior post provided an overview of exports and imports for the four commodities used to price producer milk in the U.S. 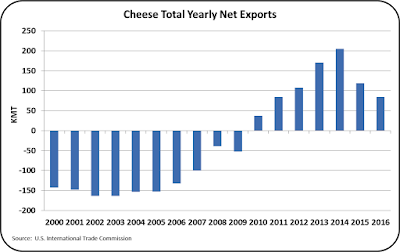 Considering the global oversupply and low prices, exports did well. 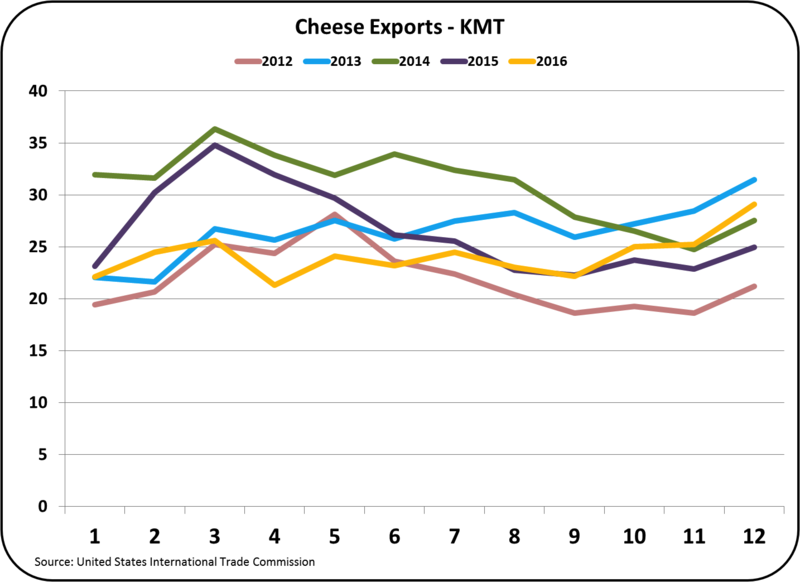 However, the increased volumes of dairy imports did offset the export efforts. If TPP had been approved, all protection from imports including the two-tiered tariff and quota program would have been eliminated (see prior post). With a strong USD and global overproduction, imports might have increased well above the 2016 levels. 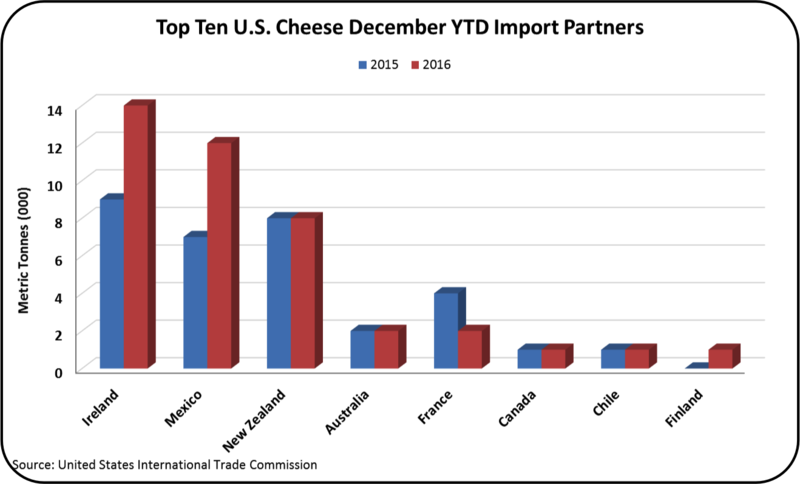 The dairy export/import market could be volatile in 2017 as new approaches to international trade are discussed and new trade agreements implemented. Those events will continue to be covered in the blog. Component price changes were more dramatic. Butterfat increased in value by 8.1%, Other Solids increased in value by 21.3%, but milk protein dropped by 19.1%. 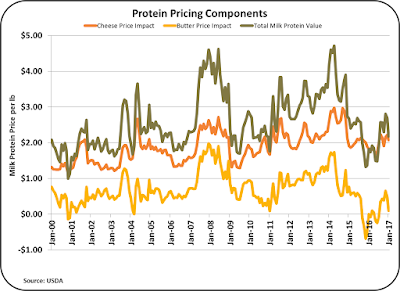 The drop in the price of milk protein resulted from both the decreased price of cheese and the increased price of butter. 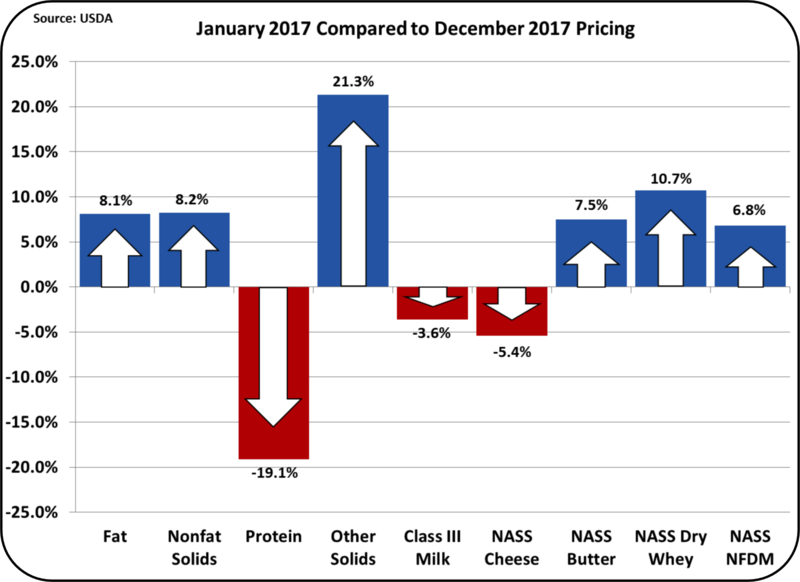 As shown in the chart below, both components that make up the formula for pricing milk protein had a negative influence in January. 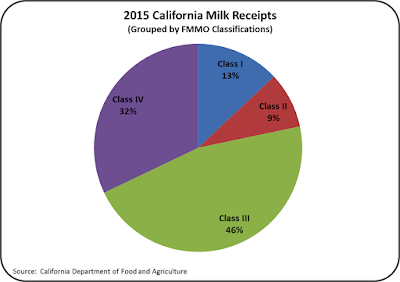 This has shifted the financial contribution of milk protein and butterfat. Butterfat is now contributing 53% to the Class III milk price. 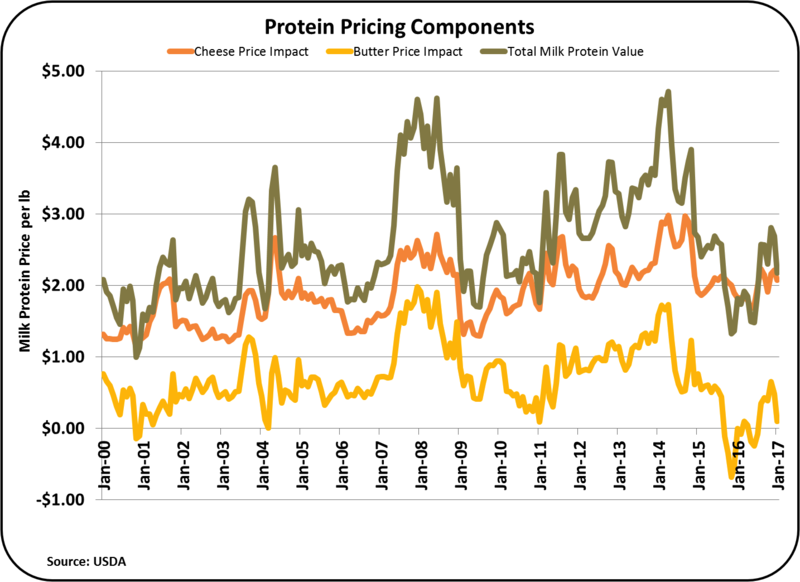 Milk protein is now contributing a lower value making up 39% of the Class III price. To compare this to the prior month, refer to the January 8 post to this blog. This has also influenced the long-term trends. 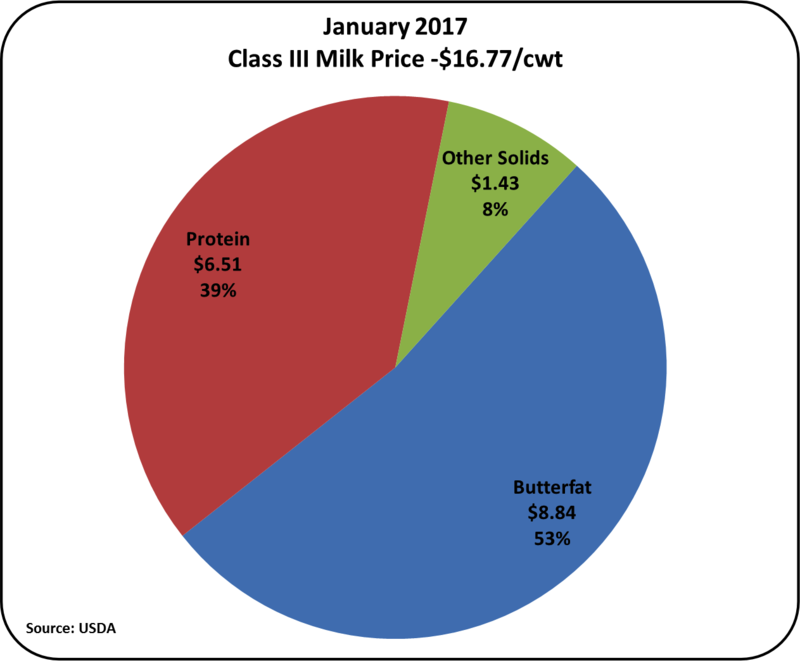 Butterfat is now worth more at $2.53/lb. compared to milk protein at $2.18/lb. 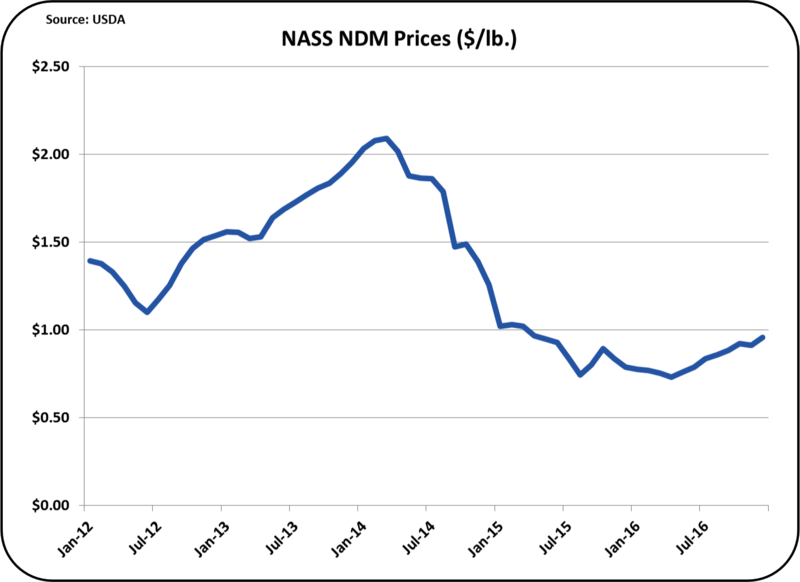 Other Solids continued its gain reaching $.25/lb., a higher price than seen in all of 2016. The price of other solids is based on the price of dry whey, which is primarily an export item. More data on this is covered later in this post. 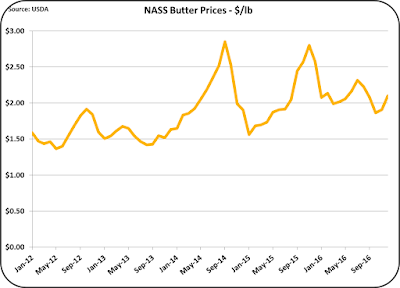 The increased butter price is influencing the above trends. 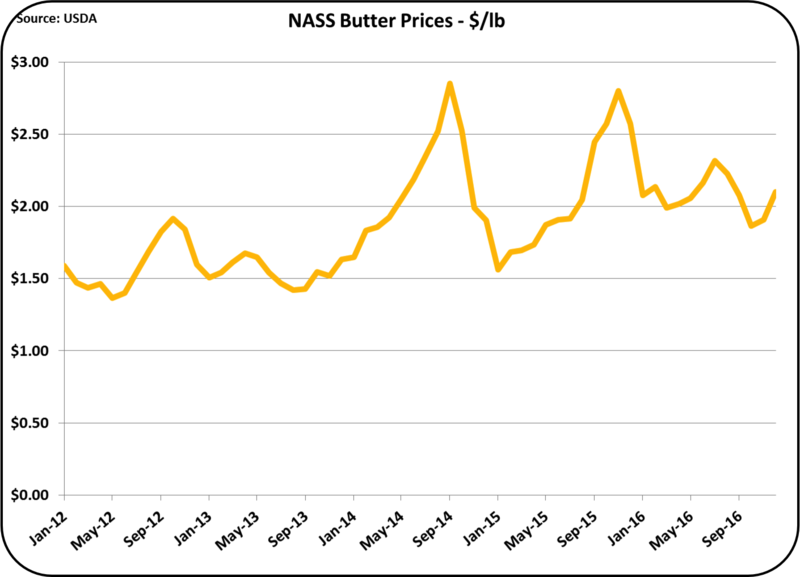 The butter price chart shown below has five years of data. While butter is again over $2/lb. it is still far from the peak prices reached in 2014 and 2015. 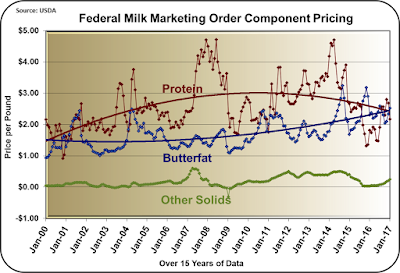 The price of butter has seen a gradual increase starting in 2010. Initially this looked more like a normal fluctuation, not a trend. 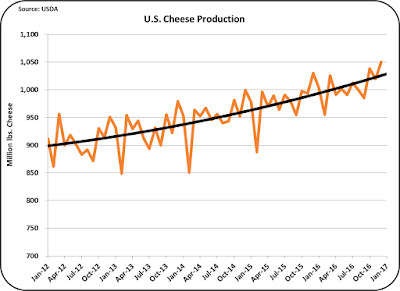 However it is now clearly a trend, increasing from around $1.50/lb. in 2014 to around $2.00/lb. in 2016/7. 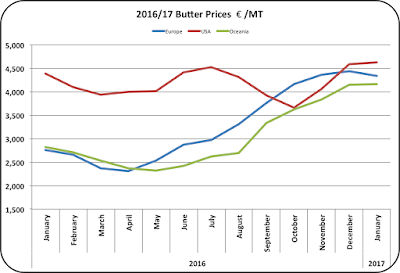 If consumer consumption of butter continues to grow, butter prices will likely continue this increase. A review of inventory levels does raise some concern. 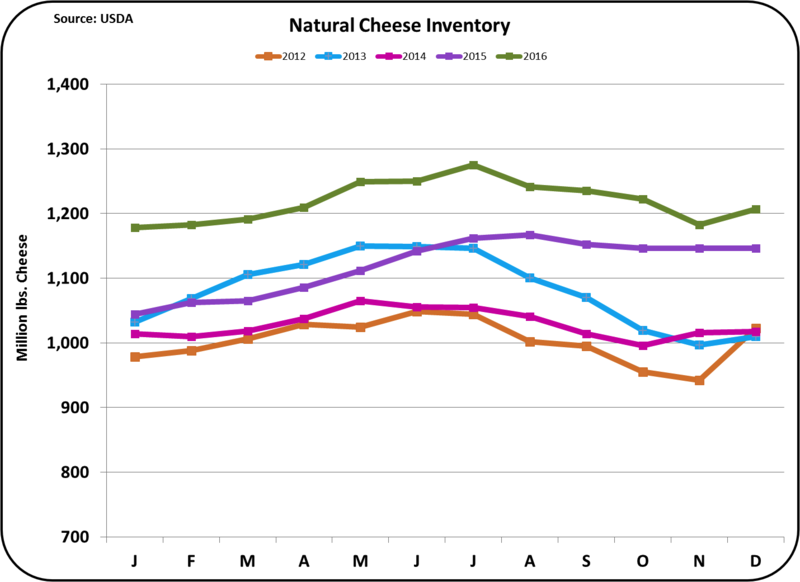 Inventories of cheese rose in December after four months of declines as shown in the chart below. 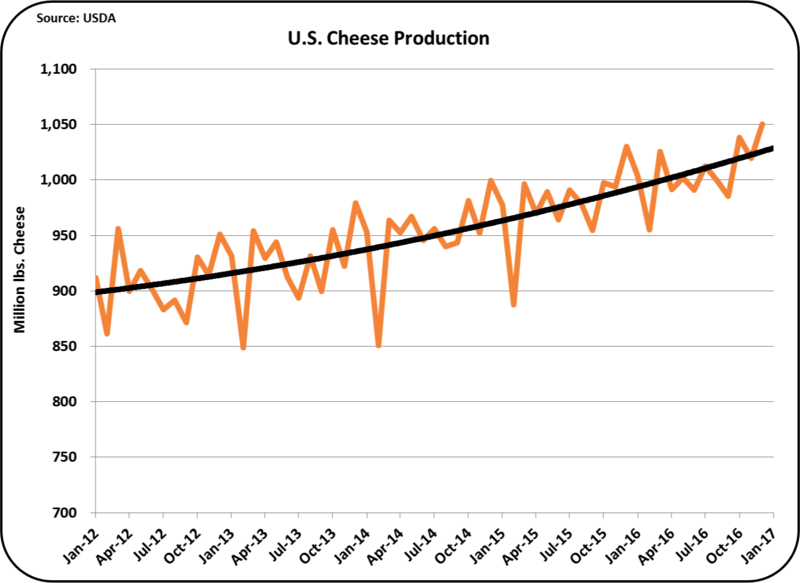 Cheese inventories do increase with the long-term trend of increased U.S. per capita consumption of cheese and population growth. 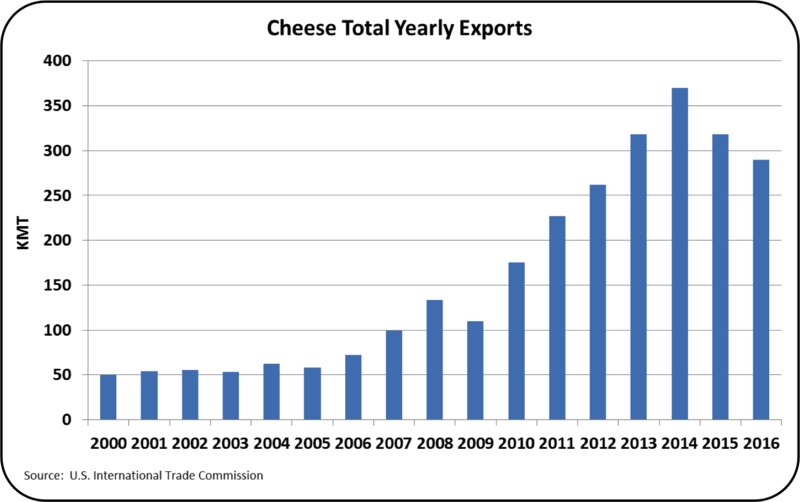 Cheese exports grew significantly since 2010, but declined starting in 2015. The pace of production of production has increased steadily in spite of the decline of in exports. 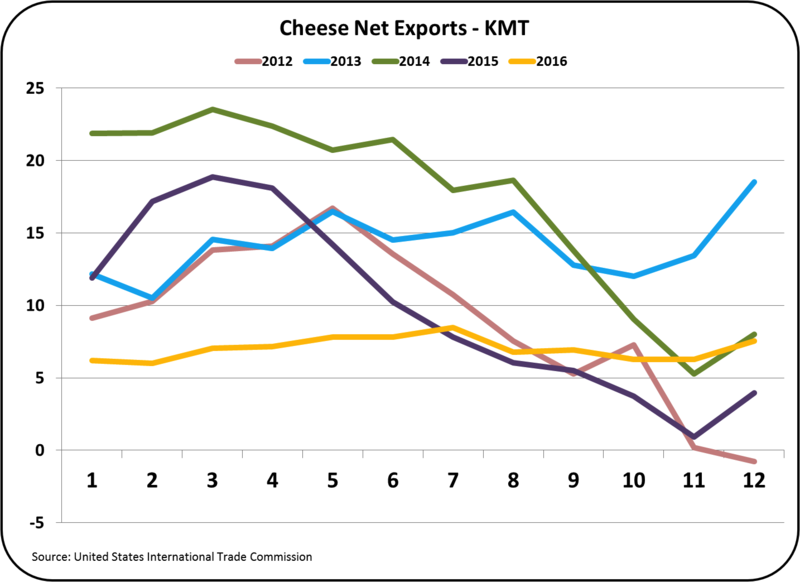 The chart below shows that starting in 2015, as exports declined, cheese inventories have been above the normal growth trend line. 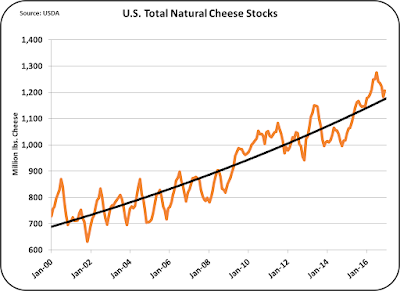 This is causing a bubble in inventories that is weighing on cheese prices. This is especially concerning because the Class III milk price is extremely dependent on cheese prices. Because of the longer shelf like of cheese vs. other dairy products, excess milk production can be temporally housed in cheese inventories. 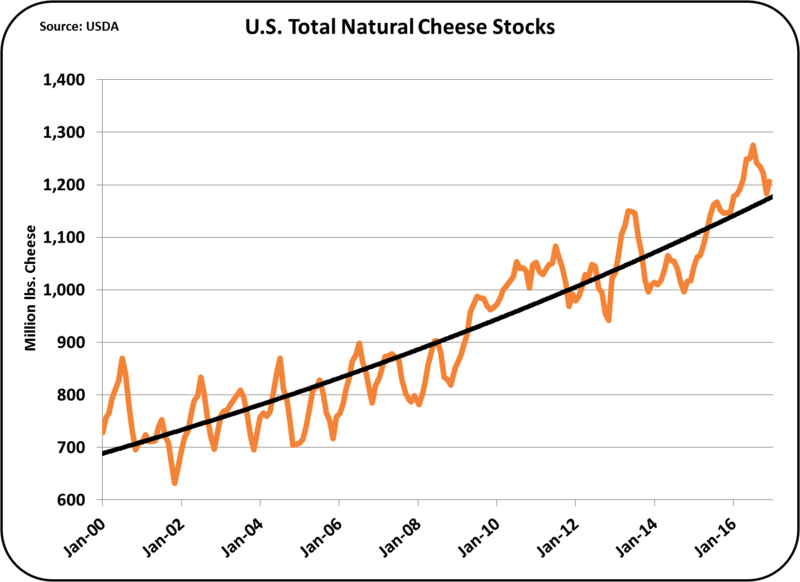 However, as cheese inventories rise, prices do decline. 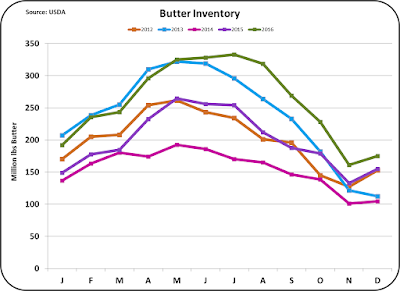 Butter inventories are also increasing as shown in the year-to-year comparison below. However, this increase is not out-of-line considering the increased per capita consumption. Because U.S. butter prices are well above international butter prices, exports are nil. 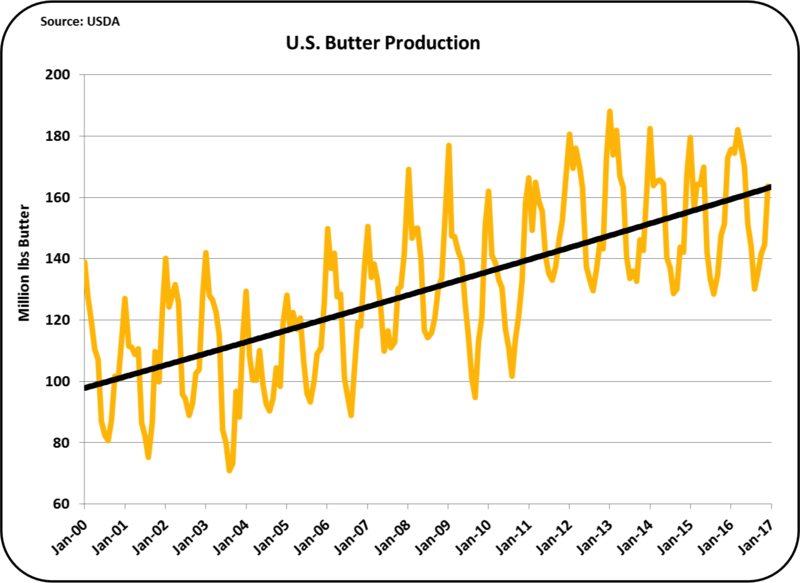 Production of butter has been on a decline for the last four years. 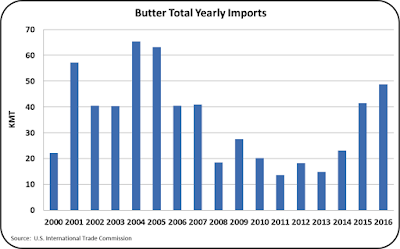 Imports of butter have been making up for the deficit. 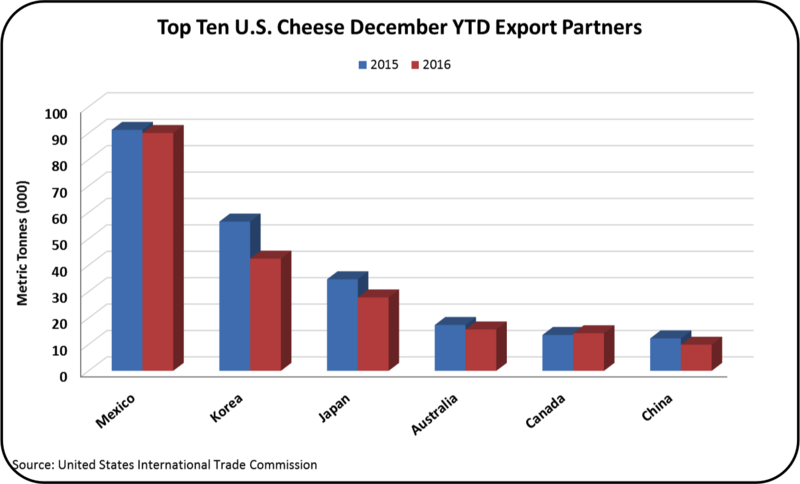 More on this somewhat unusual situation will be covered in the next blog post when December export data is available. 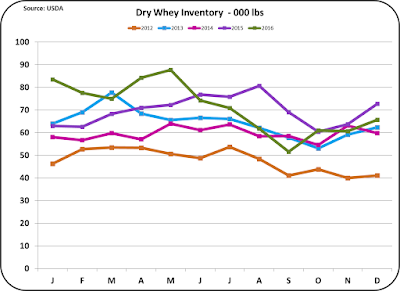 Inventories of dry whey and nonfat dry milk, both major export items, have remained at appropriate levels. 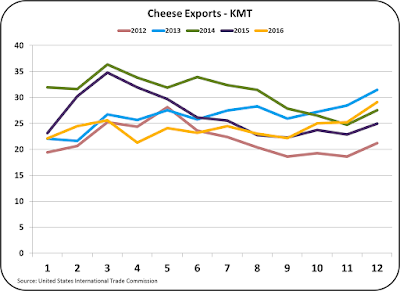 Exports have remained strong and January 2017 prices for both products are will above 2016 prices. 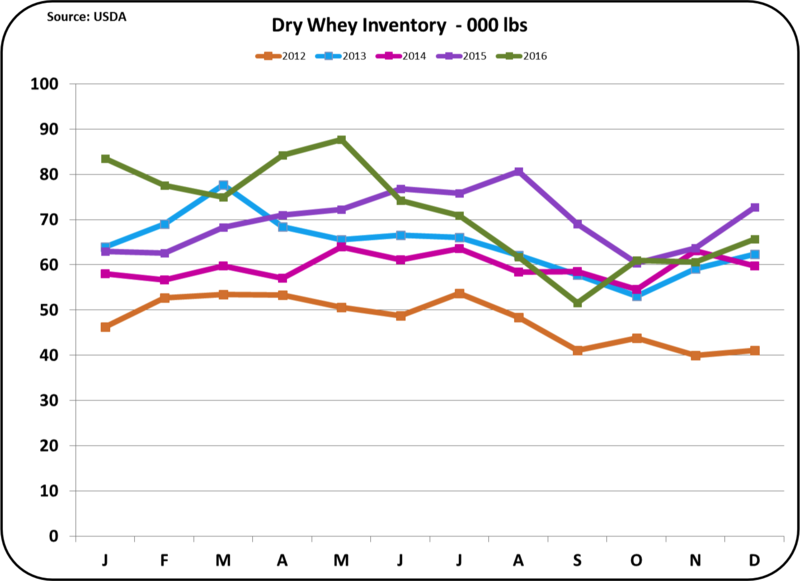 As mentioned above, dry whey is the basis for other solids pricing. The current price is well well below 2012 to 2014 pricing, but is increasing. 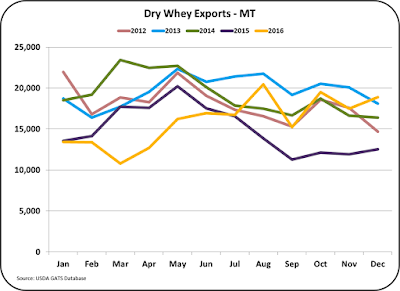 There is an interesting article in the current dairy exporter blog, citing the increased global demand for whey protein. Dry whey does have a reputation for being a good source of dairy protein. However, whey protein represents only about 18% of the protein in milk, with the rest going into cheese. Dry whey is primarily lactose. 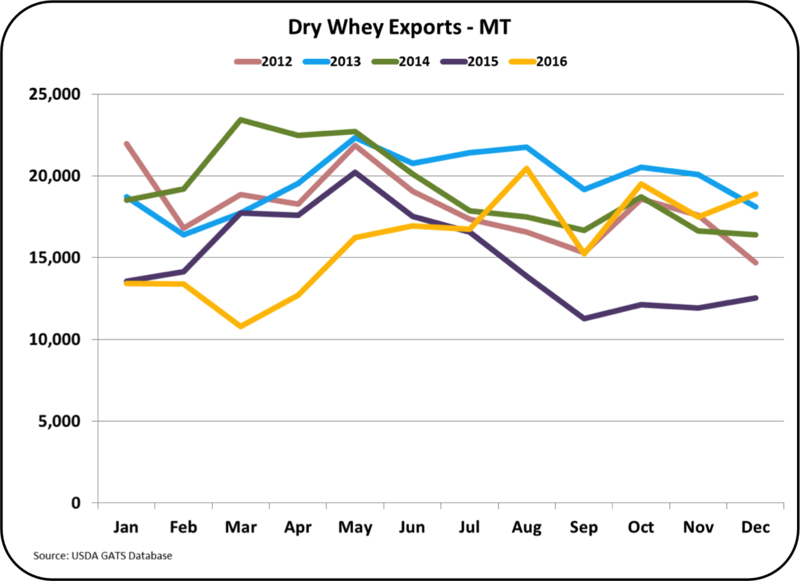 Nonfat dry milk exports have remained very strong. Pricing has been poor, but it is increasing. 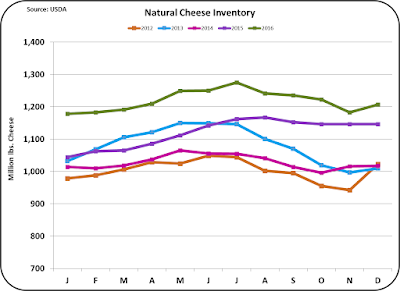 As a result, inventories have remained at very acceptable levels. 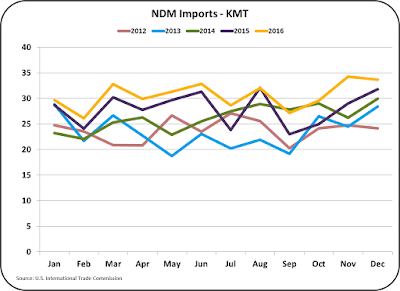 While exports of dry whey and NDM remain strong, there is concern that the very strong USD will keep prices below the high levels seen in prior years. More will be examined on this in the next post that will cover dairy exports for the full year of 2016.